beaches, offshore fishing, and a broad band of very flat land, some of it marshy. In several parts, notably in the far southwest, the coastline is quite heavily built up with sea front development; but in other parts, notably away from the towns, there are long sections of unspoiled coastline. The ports of La Rochelle and Rochefort are very attractive, as well as being popular with yachtsmen. South of the Gironde, the coast offers miles and miles of sandy beaches. Inland from the coast, the southwest of France is very pleasant; the Charente Maritime and Deux Sèvres area is often called the "green Venice", on account of its extensive network of drainage canals and waterways. This is a region where the pace of life is slow, like the water in the rivers that flow through it. Rowing boats can be hired in many places. North west of Bordeaux lies the Saintonge, the home of Cognac and the aperitif wine "Pineau". This generally flat agricultural region is famous for its historic churches, many of which have exquisite medieval carvings. South west of the historic city of Bordeaux lie "les Landes", the largest continuously forested area in Western Europe; and of course, in the Aquitaine region around Bordeaux lie miles and miles of famous vineyards, producing a wide range of wines that include some of the best and most expensive in the world. Inland from Bordeaux lies the Dordogne "department", rising from the coastal plain in the west towards the Massif Central in the east. This part of southwest France , centered round the town of Perigueux, is famous for its farmland and fine cuisine. Its pretty villages and towns have long attracted holidaymakers and retirees from Britain, to such an extent that there are now villages with their own cricket club and pub "à l'anglaise", not to mention a range of craftsmen and artists who have fled the hassle and the colder climate further north. The climate on France's Atlantic coast is generally mild to warm for most of the year; and although rain cannot be excluded even in summer, the clouds often pass over the coastal region, before breaking over the hills further inland. The inland region of Midi Pyrénees, capital Toulouse, includes much of historic Gascony, a large rural area of gently rolling hills and plains, rising up to the Pyrenees. 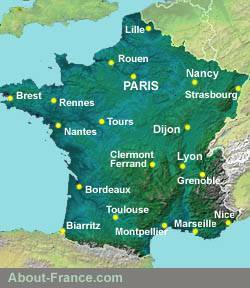 This region is famous for its medieval bastide towns that can be found throughout the region. Along its southern edge, the Pyrenees rise majestically to the Spanish border, providing southwest France's area of high mountin terrain, with ski resorts in winter. In the north of the region lies the unspoilt area known as the Quercy, with its historic small towns such as Cahors, its oak forests, and its limestone gorges; to the east lies the Aveyron, with its beautiful rolling hill country, culminating on the desolate plateaux of the Larzac and the Aubrac.